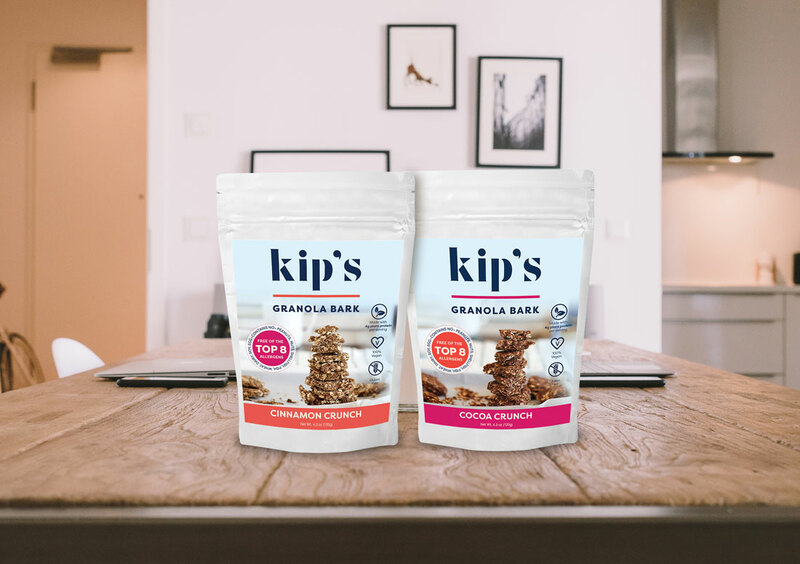 Originally called Kip’s Nut Free Kitchen, a nut-free, vegan granola based snack, Kip's Granola Bark was started in the founder’s home kitchen. 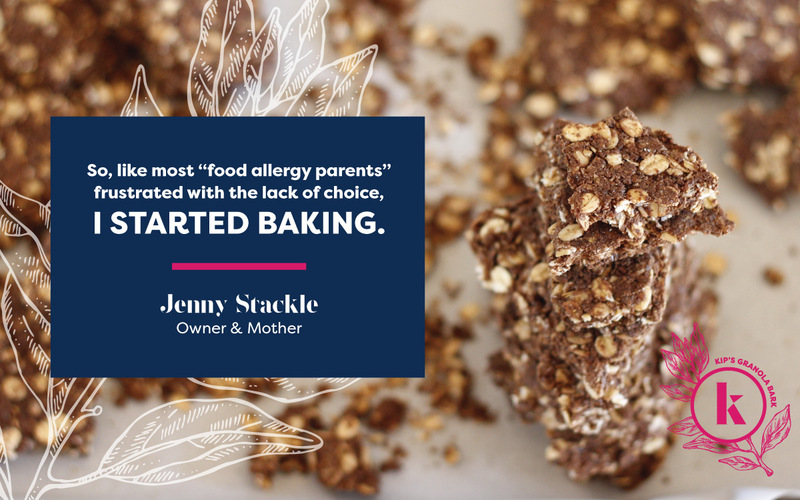 Jenny started baking these snacks because her son, Kip, suffered from severe nut allergies. Sharing them with friends and family, Jenny soon realized she had a viable product to sell. 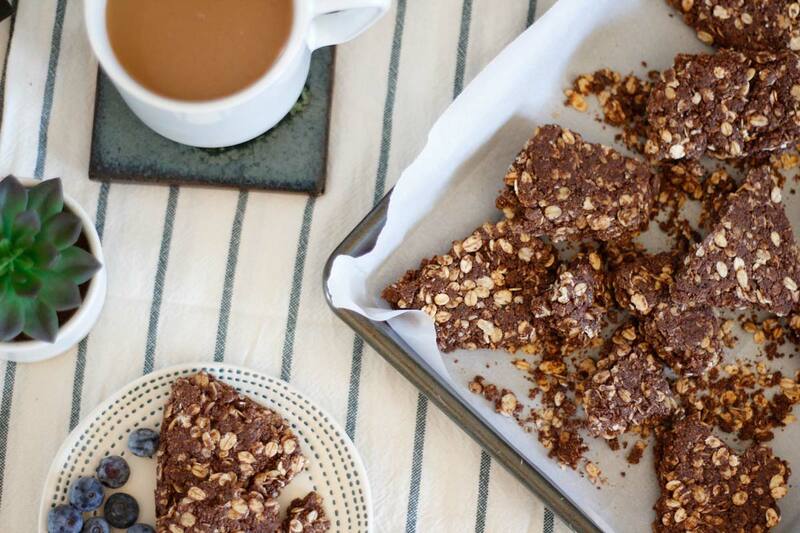 She started to sell Kip’s Granola Bark at local farmer’s markets and grocery stores. Soon enough, she started selling out of the product and realized she was ready to take her business to the next level. Create brand goals and company vision. The old logo for Kip’s worked well in a standalone booth at a farmer’s market setting, but didn’t stand out on highly competitive store shelves. Aligning the company and brand vision, we designed a more sophisticated identity that really popped. "I thoroughly enjoyed working with Virginia, Jess, and Amie at The Cowlick Appeal. I had never gone through a branding exercise before and I found it to be such an interesting and fun experience. They knew all the right questions to ask to draw out of me the meaning behind my brand, my brand values, who my customers were, etc. I couldn't be happier with the new logo, color palette, and design elements that they came up with, and the packaging and website to go with it all. They were, and continue to be, incredibly responsive via email and phone. Working with them was truly the most "fun" I've had with my business in years, and I'm so happy with the results. I highly recommend working with The Cowlick Appeal to inject some new life into your brand." 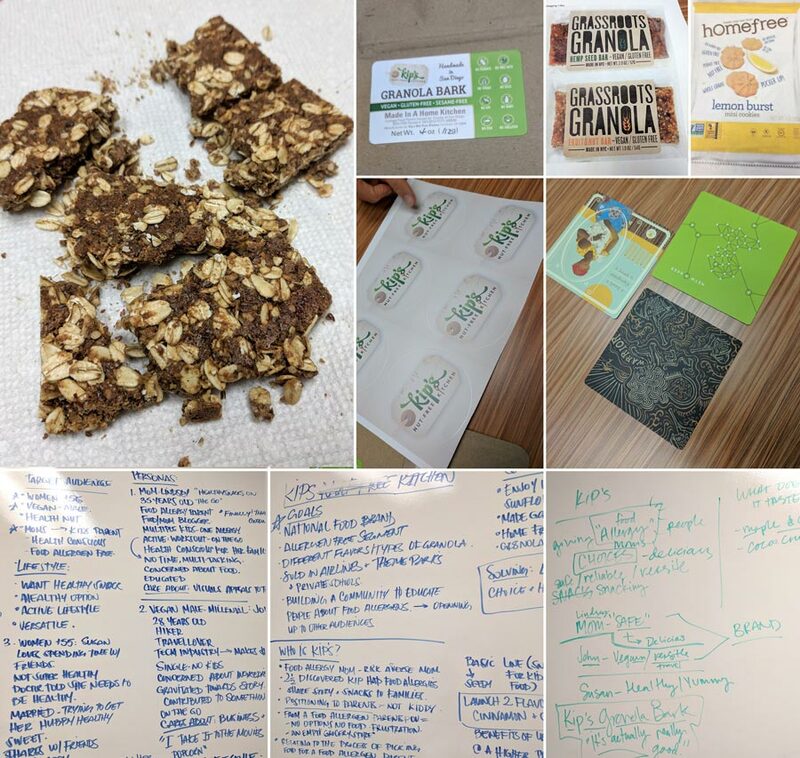 The goal of every discovery meeting is to find the heart of our clients’ business, product, deliverables and really ensure everything is aligned. Through our brand discovery process, Jenny realized that her desire to keep Kip’s brand in neutral tones with a folksy appeal should change drastically as we began to help her imagine her product flying off shelves and being sold online. We surveyed the marketplace, scoured store shelves, researched like products, and refined her approach by considering her specific target audience. 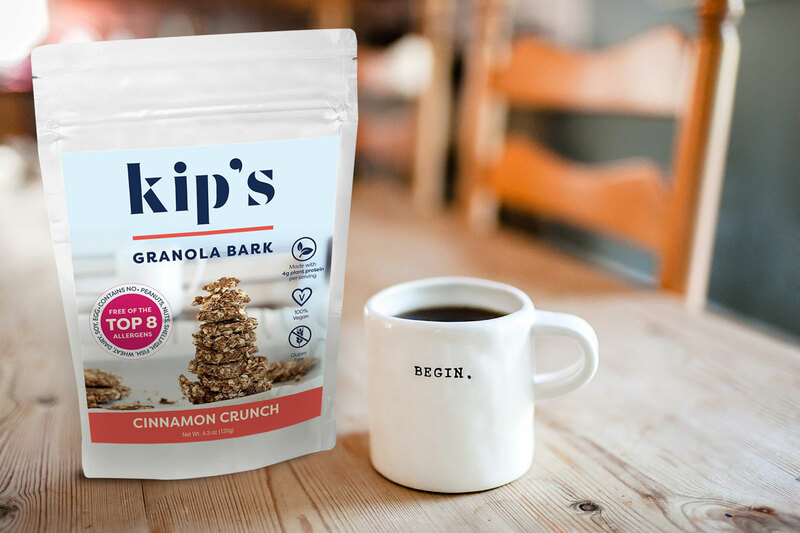 With Kip’s new brand and packaging, their audience knows to expect a higher-end product meant for a broader audience than just customers with dietary restrictions. Our team considered the overarching goals of the company, the competition, and got into the mindset of the customer to create a well-rounded brand that went far beyond a new logo creation. With Kip’s bold color scheme, unique typography, custom photography, lux textures, streamlined copy, and made-to-order artwork, our team was able to build a strategy that will set the brand up for a successful launch and sustained growth. 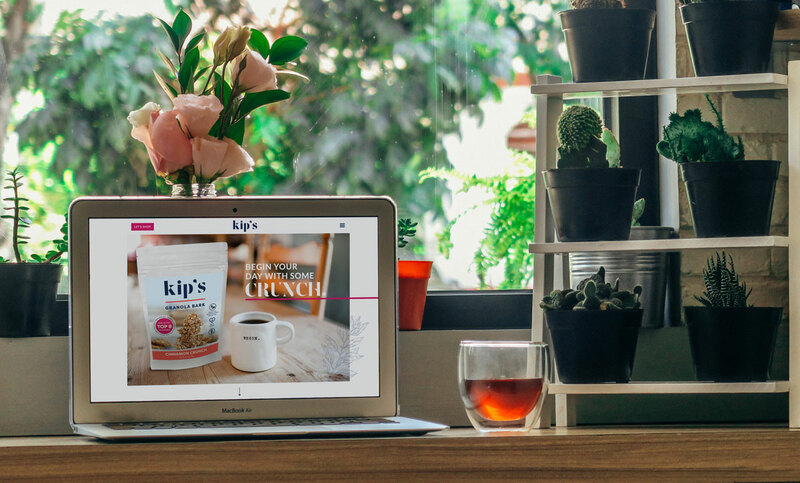 Custom photography was used to make consumers feel like Kip’s should be on their breakfast table every morning. Selling Kip’s online was to be a new venture for Jenny. We needed to build a custom website that told Kip’s story, engaged the audience, and provided the e-commerce technology to easily make a purchase online.